I heard this gorgeous beastie moving about in the shrubbery as I climbed the path up to the house last night. I did it the indignity of bringing it out for a closer look. 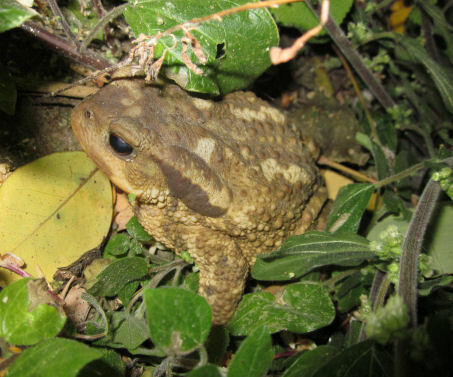 I can’t work out what it is, as the warts imply it’s a toad, but the markings are more like those of a frog, and my junior I-Spy books told me that a toad would leave a stink behind on my hands from the warts – which it didn’t. 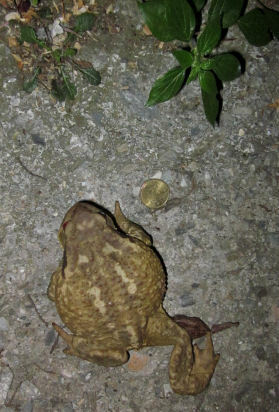 And this is no English bit of nature study – because I have never seen a frog/toad this size before. That’s a 50-cent coin, which measures 24mm diameter. That makes it about 150mm long, nose to non-tail. I am impressed. 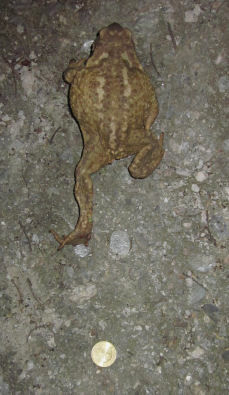 [Later] a bit of searching tells me this is Bufo bufo spinosus, a Mediterranean variety of common toad. The poisonous skin thing is true, it will kill a dog which bites it. The bulges behind the eyes are the paratoid glands, which are contain a noxious substance, bufotoxin. She must have known I am vegetarian, i.e. not a predator. Could have done with better pics, but this was balancing phone-as-torch, camera, wallet (for coin) and toad which kept running off, on a very steep slope in the dark. This entry was posted on April 13, 2012 at 12:10 am and is filed under Wild kingdoms. You can follow any responses to this entry through the RSS 2.0 feed. You can leave a response, or trackback from your own site.